How often should AC612/21 be agitated? We offer a range of synthetic lubricants specifically for power tool components, to increase performance, reduce power consumption, improve ergonomics and lengthen functional life of components. Power tool gears encounter both high loads and high speed operations, with frequent on/off cycling. Nye synthetic grease will minimise gear wear, lower tool temperatures, reduce power consumption and extend operating life and improve device performance. We have two versions of a the same product, one softer than the other (NLGI Grade 1 and 2). Plastic on plastic mechanical interfaces often need lubrication to address issues with manufacturing tolerance variations. 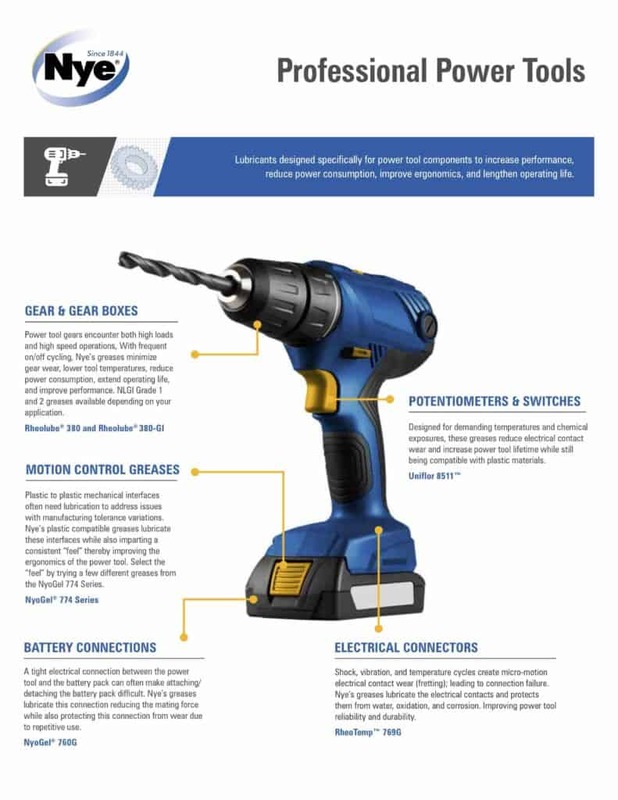 Nye offer plastic compatible synthetic grease to lubricate these interfaces while also imparting a consistent ‘feel’ for the customer, thereby improving the ergonomics of the power tool. Selecting the appropriate ‘feel’ a grease can offer by evaluating the different levels of viscosity from the Nyogel 774 range of damping grease. A tight electrical connection between the power tool and the battery pack can often make attaching and detaching the battery pack difficult. Nye connector/contact greases lubricate this connection, reducing the mating force while also protecting the connections/contacts from wear due to repetitive use. Designed for demanding temperatures and chemical exposures, our fluorinated greases reduce electrical contact wear, resist hazardous chemicals and increase power tool functional life while still being compatible with plastic materials. Shock, vibration and temperature/thermo cycling create micro-motion electrical contact wear (fretting), leading to connection failure. Nye greases lubricate the electrical contacts and protect them from water, oxidation and corrosion. The power tool reliability and durability is greatly improved. Please get in contact to find out how we can help you with your Power Tool component lubrication requirements.